Brian Gomez has his fingers wrapped around a small bar attached to three short springs in a rectangular metal frame. It’s similar to the handlebar brake lever of a dirt bike, like the one Gomez was riding in 2011 that malfunctioned, causing a crash that left him paralyzed below the neck. He’s trying to close his hand, but the bar doesn’t budge. Then a switch is flipped, and tiny electrodes implanted on his spinal cord begin firing. “It’s like a fluid shock going through” his body, he says. Gomez straightens in his wheelchair. His forearm twitches, and his grip tightens. The metal bar moves. With spinal injuries, the body loses voluntary control over functions below the point of trauma. Damage the spinal cord in the lower back, and your legs are affected; damage it in the neck area, and functionality is limited for everything from there down. Lu’s approach, which builds on more than 40 years of research by UCLA neuroscientist V. Reggie Edgerton, redraws neural connections in the damaged area, essentially reminding the cord of what it once did. “It’s retraining that circuit to work again,” says Lu. When the electrodes are turned off, it can still remember. Researchers are also developing robotically controlled exoskeleton devices to move disabled limbs, and a clinical trial will soon test a chip implant that allows direct brain control of a computer interface. 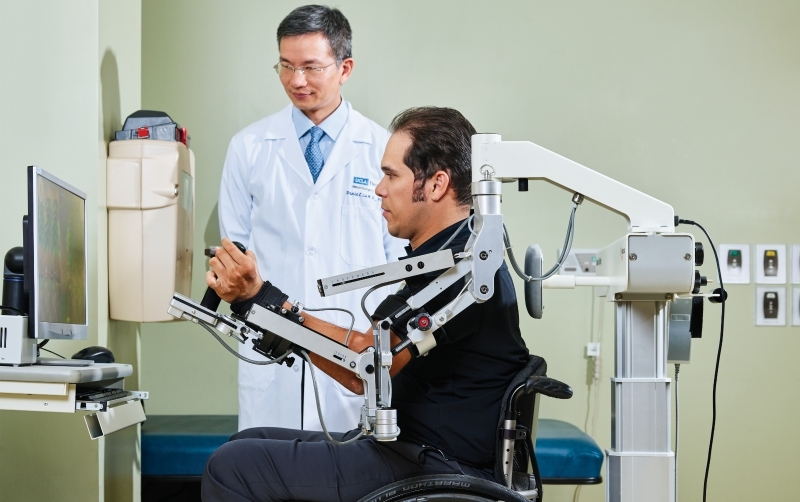 These are promising treatments for the most extreme cases of paralysis, but Lu notes that the majority of injured cords aren’t completely severed. A lingering cellular connection means that repair is possible and ability can be regained through the targeted use of electrode stimulation, as with Gomez.